At the start of this year my brother came to me with a thought that a train would make a good addition to the Christmas display he has on his front lawn. With Christmas fast approaching he hunted out a model that we could cut on the CNC and this episode is the start of the train build process. This train is going to be large when it is finally complete and if all goes well it will be motorised so that it can run on a track. The first step in a project like this is to get the train itself built so in this episode we start cutting out the model and get parts of it assembled. Scaling the model is a necessary part of making this model and i like to make things as simple as possible. That means not having to hunt around for a calculator to work out how much to upscale the model by. To make things easy I developed the Box Method of scaling which in my opinion the easiest way of scaling a drawing accurately snce you don't need to calculate anything. There are just 3 simple rules to the scaling method. The box must be larger that the item being scaled. One side of the boxes dimension must bear a direct relationship to the measurement being scaled. eg for a 3.4mm item I wanted to scale to 5mm I would make one side of the box 3.4 metres long. Select the new box and everything inside it. Scale the dimensioned side of the box to the new dimension eg. If I wanted my 3.4mm piece to become 5mm the I would scale my 3.4 metre to 5 metres and the drawing will be automatically scaled to the correct size all without having to work out the scale factor. In the next episode I will be showing how I layout the parts for cutting and how to use the 180 degree method to cut the remaining parts on the end of the stock. Untill next time thanks fortaking the time to watch and read. The length of the cutting edger is 10mm ( 3/8") but anything similar eg 12mm(1/2") or 6mm(1/4") cutting edge would work just as well. There is little point having a longer cutting edge unless you are looking to cut your material in one pass. The flute area is weaker than the main shaft so a longer flute just weakens the cutter in my opinion. In fact since I do not cut more than 1/8th per pass any flute longer than 1/4" is a waste. can you give a link to the bit you are useing for the train cutting. These are the ones I purchased about 2 years ago form this supplier on ebay and they have served me well. Dumb question on 're-scaling'... If you re-scale the train to accommodate the 1/2-in wide slots, from 1/4-inch slots. Does that effectively double the size of the whole thing? Not a dumb question at all, but brace yourself for a dumb answer. It depends what you mean by size. Rescaling a model from 1/4" to 1/2" makes the model twices as long , twice as wide, twice as high but it makes it 4 times larger because it is a 3d object. eg you could fit 4 of the original models into the new one. I was thinking that you could just resize the slots and I suppose you could have done that but that you actually wanted a larger train. I do really like your 'scaling' method. 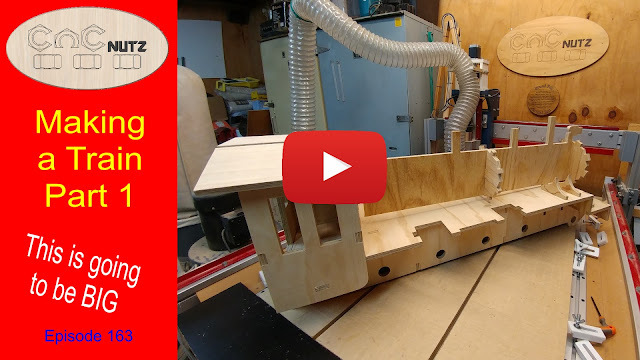 I just bought some of the "MakeCNC" puzzles and I will use your method to scale them. I love your videos; keep up the good work, there's no way I can keep up but it sure makes me want to try. You cannot just resize the slots as nothing would fit together. These are complex puzzles from a design point of view and everything needs to be scaled to match the material thickness. In my case the material thickness was determined by how big I wanted the final train and also my table size. Enjoy Your puzzle builds.